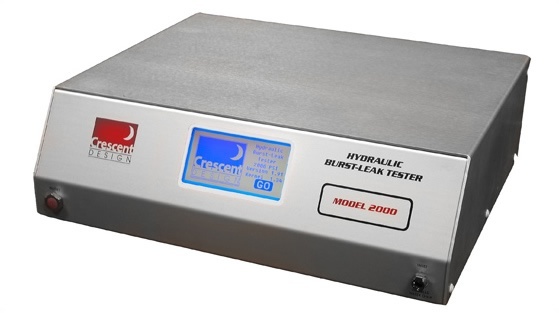 The Hydraulic Burst-Leak Tester (HBLT) is a table top, computer controlled device used for destructive and nondestructive hydraulic (distilled water) pressure testing. The touch screen interface allows the operator to program and save up to 40 different custom tests. The HBLT can be operated remotely over the serial link using either the optional Pressure Manager Software, available through Crescent Design, or by user created remote control software. The HBLT uses distilled water only, as a total loss working fluid. This will eliminate dissolved mineral precipitation inside the hydraulic system and improve reliability. Display in () Test program set-up and results displayed in selected units (PSI, ATM, BARS or KiloPascals). Total cycles The total number of cycles that the tester will perform before returning to zero. Ramp Rate In PSI, ATM, BARS or KiloPascals/second. The rate at which the tester achieves the target pressure. 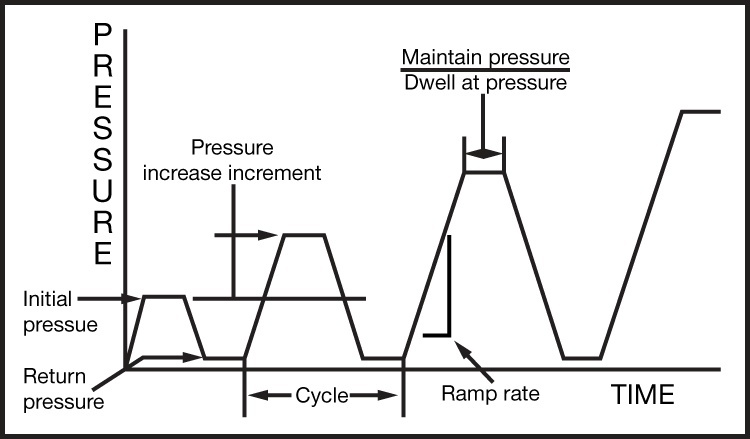 Both the ascending ramp rate and the descending ramp rate are adjustable. 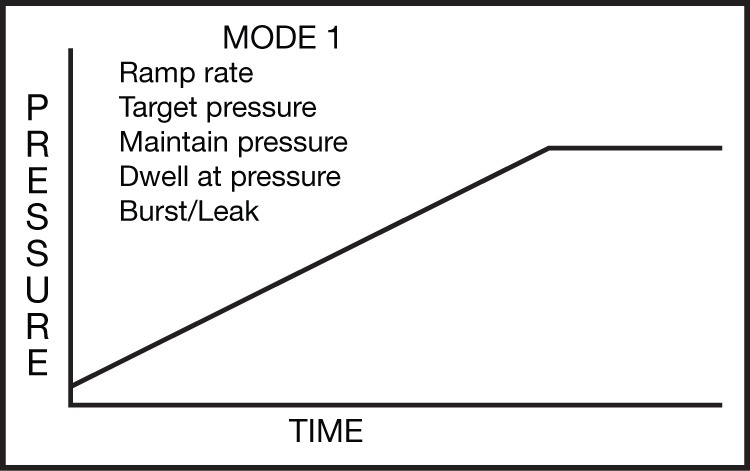 Initial target pressure First (and lowest) programmed pressure tester will achieve. Target pressure Programmed pressure that the tester will achieve during any given cycle. Return pressure Programmed pressure that the tester will achieve at the end of each cycle. Cycle repeat Will default to 1. The tester will repeat each cycle this many times before proceeding to the next programmed target pressure. 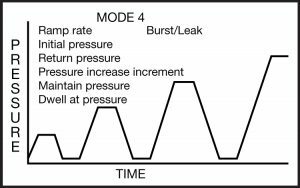 Pressure increase increment Pressure value that will be added to the current target pressure to establish the next cycle target pressure. Maintain pressure 0-999 seconds and must be less than or equal to “dwell at pressure” value (see below). 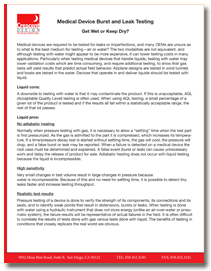 Tester will maintain target pressure for this period of time to allow test product compliance. Compliance Adjustable parameter for specific product compliance. Pre-fill rate Use to pre-fill product prior to test. Dwell at pressure 0-999 seconds. This is the time spent at the target pressure. There is a period of time during “dwell” that the HBLT is not maintaining and it is during this time that the HBLT detects leaks. 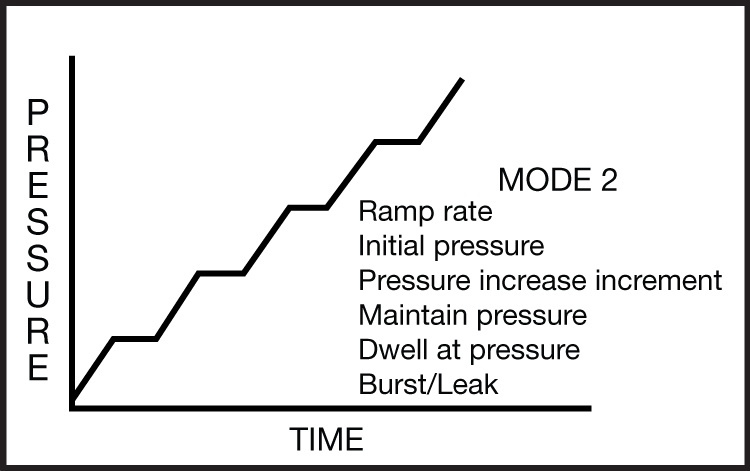 Burst/Leak Burst and Leak criteria are specified as pressure decay rate faster than user specified value. 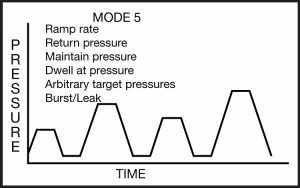 When developing a test program in Mode 1, the operator will be prompted to enter the desired Compliance, Ramp rate, Target pressure, Maintain pressure, Dwell at pressure, and Burst-Leak parameters. During the test the Burst-Leak Tester will achieve and maintain the proper ramp rate until the target pressure is reached, then maintain and dwell for the programmed time, or until a burst is detected. 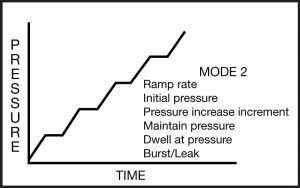 When developing a test program in Mode 2, the operator will be prompted to enter the desired Compliance, Ramp rate, Initial pressure, Pressure increase increment value, Maintain pressure time, Dwell at pressure time, and Burst/Leak parameters. During the test the Burst-Leak Tester will achieve and maintain the proper ramp rate and achieve the proper initial pressure. It will Maintain pressure for the programmed time to allow for test product compliance. It will then switch to Dwell at pressure, stop maintaining the pressure, and continuing to look for leaks or bursts. 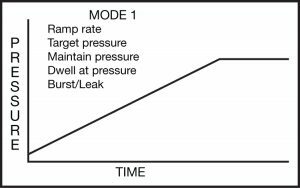 When Dwell at pressure time is complete, the Burst-Leak Tester will add the Pressure increase increment value to the current pressure and proceed to the new target pressure at the programmed ramp rate. When developing a test program in Mode 3, the operator will be prompted to enter the desired Compliance, Ramp rate, Burst/Leak parameters, Target pressure, return pressure, Maintain pressure time, Dwell at pressure time, and Number of cycles. During the test the Burst-Leak Tester will achieve and maintain the proper ramp rate and achieve the proper target pressure. It will Maintain pressure for the programmed time to allow for test product compliance. It will then switch to Dwell at pressure, stop maintaining the pressure, and continue to look for leaks or bursts. When Dwell at pressure time is complete, the Burst-Leak Tester will reduce pressure to the Return pressure for Cycle Delay and then repeat the cycle for the programmed Number of cycles, or until a burst or leak is detected. 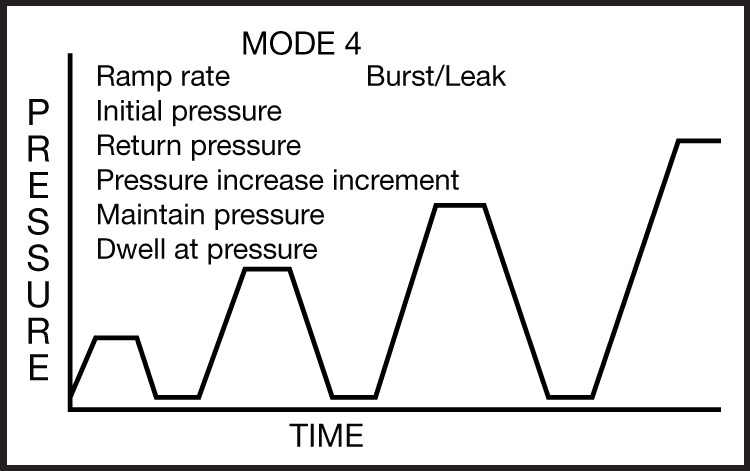 When developing a test program in Mode 4, the operator will be prompted to enter the desired Compliance, Ramp rate, Burst/Leak parameters, initial Pressure, return pressure, Cycle repeat value, Pressure increase increment value, Maintain pressure time, and Dwell at pressure time. During the test the Burst-Leak Tester will achieve and maintain the proper ramp rate and achieve the proper initial pressure. It will maintain pressure for the programmed time to allow for test product compliance. It will then switch to Dwell at pressure, stop maintaining the pressure, and continuing to look for leaks or bursts. When Dwell at pressure time is complete, the Burst-Leak Tester will reduce pressure to the Return pressure for Cycle Delay. The Burst-Leak Tester will then add the Pressure increase increment value to the current pressure and proceed to the new target pressure at the programmed ramp rate. 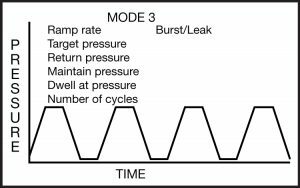 This cycle program will continue until maximum pressure is achieved or a burst or leak is detected. 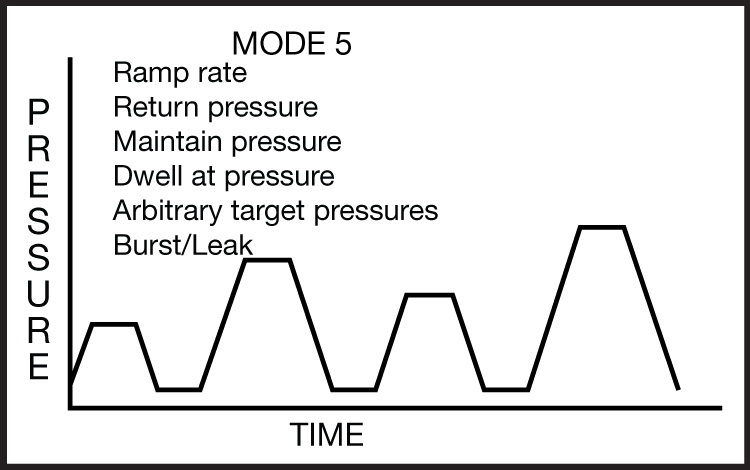 When developing a test program in Mode 5, the operator will be prompted to enter the desired Compliance, Ramp rate, Burst/Leak parameters, Return pressure, Maintain pressure time, and Dwell at pressure time. The operator will then be asked to enter each sequential pressure value desired during this test. These may be any value, in any order, within the Burst-Leak Tester’s pressure range. During the test the Burst-Leak Tester will achieve and maintain the proper Ramp rate and achieve the proper initial Target pressure. It will maintain pressure for the programmed time to allow for test product compliance. It will then switch to Dwell at pressure, stop maintaining the pressure, and continue to look for leaks or bursts. When Dwell at pressure time is complete, the Burst-Leak Tester will reduce pressure to the Return pressure for Cycle Delay. The Burst-Leak Tester will then proceed to the next arbitrary target pressure at the programmed ramp rate. The program will continue until the last programmed arbitrary target pressure is achieved or a burst or leak is detected.